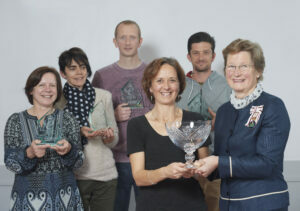 Seafood export specialists FAO27 had a surprise visit from Lord-Lieutenant of Ross, Cromarty, Skye and Lochalsh recently to receive their Queen’s Award for Enterprise for International Trade, the UK’s highest accolade for business success. Based in the Black Isle and France, FAO27 was set up in 2009 as a consultancy to help fishermen and processors export to Europe. It now has now a team of five and supports over 150 full time jobs and several family run businesses in Scotland. The FAO27 team was surprised during its quarterly meeting at Dingwall Community Centre with each team member receiving an award. The firm continued its recent winning streak with the award for Best Marketing Initiative at the Highlands and Islands Food and Drink Awards in Inverness last week, in recognition of the creativity, innovation, imagination and clarity of their marketing campaigns over the past year. Earlier in the month FAO27 were named regional winners in the export business category of the British Chamber Business Awards and now go forward to the national awards in London in November. Design by 2bcreative. Website hosting by Aurora.